In films set in a specific historical era, about a specific historical event, the relationship between what is shown in the film and what actually took place is an intriguing one. Tell Them Willie Boy Is Here , even before the Universal logo is seen, introduces, via a caption which is also unnecessarily read to us, “an extraordinary historical event” -in this case from 1909- and ‘this is what happened’. Thus, a note of authenticity is struck even before the film has truly begun, and it is one that does impact on the events that follow in a film that is akin to a platter of buffet sandwiches- great to look at, but far less interesting upon closer inspection. One of the problems of a film claiming to narrate a true story is the need to adhere to a set of pre-conceived events, which can mean the material loses interest or outstays its welcome. This to some extent applies to Tell Them Willie Boy Is Here , as Polonsky’s direction is at times overly languid and unhurried. In its plot, Tell Them Willie Boy Is Here has marked similarities to Terrence Malick’s Badlands, released four years later in 1973, and builds subconsciously on guy-and-girl-go-on-the-run movies which include They Live By Night and Gun Crazy amongst others. What Malick does in Badlands, by presenting characters with psychological depth with whom we can relate, however bad their actions, is not done by Polonsky in Tell Them Willie Boy Is Here . Of the main characters, Deputy Sheriff Cooper (Robert Redford) is vapid and colourless, Willie Boy himself (Robert Blake) dislikeable, though he is still a more interesting character than Authority. It is the opposition between Authority and Willie Boy which is at the heart of Tell Them Willie Boy Is Here , but the discrimination and prejudice shown the latter is a deeply questionable motivation for his resulting deeds. Bizarrely, there are only two real instances where Lola reveals her love for Willie Boy- both these occur beside water, where the emotions overrun in moments of lyrical sensuality. The film is unquestionably beautiful to look at- Conrad Hall’s experience as cinematographer (his career included Butch Cassidy and the Sundance Kid and American Beauty amongst others) a crucial factor in the visual “look”. It is this, and pretty much this alone, that engages the interest as the chase becomes increasingly less exciting due to Polonsky’s self-indulgent direction. It is unfortunate, therefore, that the film climaxes in a note of risible and clichéd you-could-see-this-coming-a-mile-off predictability, which lessens much of the limited impact of what has gone before. 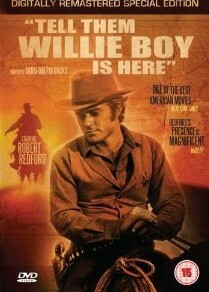 In short, a film like Tell Them Willie Boy Is Here is one of unfortunately unsympathetic performances- only Katharine Ross (with her occasional outbursts of affection for Willie Boy) and Robert Lipton (as Charlie Newcombe, the voice of reason, a character swiftly marginalised in favour of other far less interesting ones) stand out. To return to my sandwich analogy- the constituent elements need not be dull, it is what is done with them that dictates that. The main problem with Tell Them Willie Boy Is Here is that there is not enough filling to make the cinematic sandwich a satisfying one, and, like the aforementioned platter, the film ultimately outstays its welcome. If the savoury side of Tell Them Willie Boy Is Here is not sufficiently interesting, Odeon Entertainment has provided a wealth of extras which do make this release worth acquiring, particularly for the fan of Robert Redford- The Outlaw Trail (1978) and a South Bank Show special about Redford’s Sundance Film Festival are accompanied by a stills gallery and theatrical trailer. Tell Them Willie Boy Is Here is available on DVD from Odeon Entertainment.